Savor delicious Greek food and experience the rich culture of Greece at the 48th Annual Belmont Greek Festival in the mid-Peninsula, Labor Day weekend, Sat., Sept. 1 – Mon., Sept. 3, at Holy Cross Greek Orthodox Church, 900 Alameda de las Pulgas (corner of Ralston Avenue), in Belmont. Festival hours are 12-10 pm on Saturday and Sunday, and 12-8 pm on Monday. Some 20,000 guests will visit the festival over the three-day weekend to enjoy the wonderful Greek meals and pastries, lively music and dancing, a mythology play, and children’s amusement area. The marvelous meals will include moussaka (layers of seasoned ground meat and eggplant topped with creamy béchamel sauce), dolmades (grape leaves wrapped around ground beef and rice), souvlakia (Greek shish-kebab), and spanakopita (spinach and cheese stuffed inside layers of filo pastry). There will also be traditional pastries such as loukoumades (tender doughnut holes covered with honey), baklava (layers of nuts and filo pastry soaked in honey), and galactobouriko (filo pastry filled with custard and covered with syrup). A new highlight will be an outdoor Greek market, “resembling a delightful street in Greece lined with bistro tables and chairs, alongside our popular bookstore,” Clay said. The market will feature Greek coffee, frappés (iced coffee), cookies, and a Greek yogurt bar. “We’re also working with the local community to offer basic Greek food items, such as cheese, olives, olive oil, nuts, and grape leaves,” she said. To accompany the fabulous Greek food, guests 21 and over will want to try distinctive Greek wines, beer, and liquor, such as the anise-flavored Ouzo aperitif and Metaxa brandy. Festival visitors will find continuous entertainment on two large stages. At the main stage, they can dance to exciting music by a popular Greek band and watch folk dance groups perform in colorful, hand-made costumes. At the outdoor amphitheater, reminiscent of the theaters of ancient Greece, children and adults alike will delight in a Greek mythology play, as well as traditional Greek folk songs performed by the Festival Chorus and Orchestra, and crowd-pleasing cooking demonstrations. Award-winning children’s entertainer Andy Z will take to the amphitheater stage to present his sensational songs and colorful characters. The Fun Zone children’s area will also entertain the younger crowd with a jumping castle and other activities. The Fun Zone closes at 6 pm. Throughout the weekend, there will be tours of the award-winning Byzantine-style church, including the stunning mosaic iconography. Other festival highlights will include art, clothing, jewelry and gift boutiques, and a bookstore with Orthodox Christian publications and icons. The proceeds of the festival support the many ministries of Holy Cross Church, as well as monetary donations made to local organizations including: Second Harvest Food Bank of San Mateo County; Samaritan House, San Mateo; Bay Area Cancer Connections, Palo Alto; Bonnie J. Addario Lung Cancer Foundation; and My New Red Shoes, Redwood City. Pre-paid “early bird” discount admission tickets are $4.50 for general admission and $2 for seniors and youth (ages 13-17) and must be purchased online by August 31 on this website. Tickets purchased after August 31 are $6 for general admission and $3 for seniors and youth. Children 12 and under are admitted free, accompanied by an adult. Multi-day discount tickets are also available. In keeping with current trends, the Belmont Greek Festival is now cashless and accepts only credit and debit cards. Cash can be exchanged for a cash card at the festival. Pets are not permitted except for service animals. For parking information, please preview this guide. 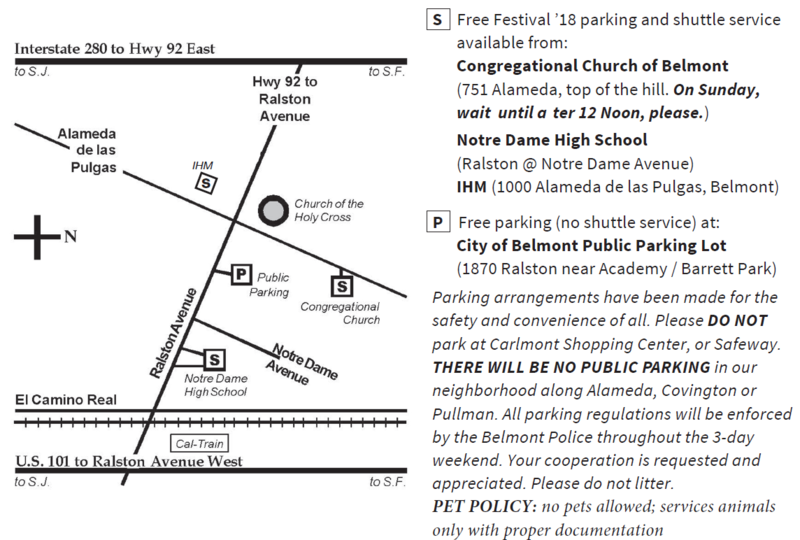 For more information, keep exploring this website or visit facebook.com/belmontgreekfestival, or call (650) 591-4447. Yassou!